Munich airport can be reached from all over the world. It is around 35km away from the city center, linked by two S-Bahn lines (S-Bahn is the commuter train network) and an additional bus connection. Both the S-Bahn lines and the bus link the airport with Munich central station (Hauptbahnhof). "S-Bahn"-Lines. It takes about 30 Minutes to the "Marien-Platz". For further information on the airport refer to the Munich Airport web pages. Olympiahalle and Olympiastadion are located in the Olympic Park (Olympiapark), built for the 1972 summer Olympics. 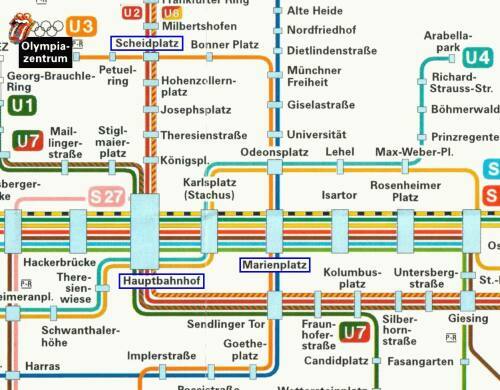 To reach both venues take the subway U3 from the city center (S-Bahn connection at Marienplatz). It takes about 15 Minutes. For big events (and at least the stadium concert is one) there is a special direct subway connection from Hauptbahnhof to Olympiapark. From Olympiapark subway station it is a 10 minute walk to either of the two venues. Cirkus Krone is located close to the city centre, within walking distance from the central-railway-station. The next S-Bahn station is Hackerbr�cke (all S-Bahn lines; 5 minute walk from here), but there is construction work going on, with S-Bahn service interruptions on weekends, so better ask in your hotel about the current situation. Other ways to reach Cirkus Krone are by tram (16/17 from Hauptbahnhof also to Hackerbr�cke) or by subway U1 to Stiglmaierplatz. 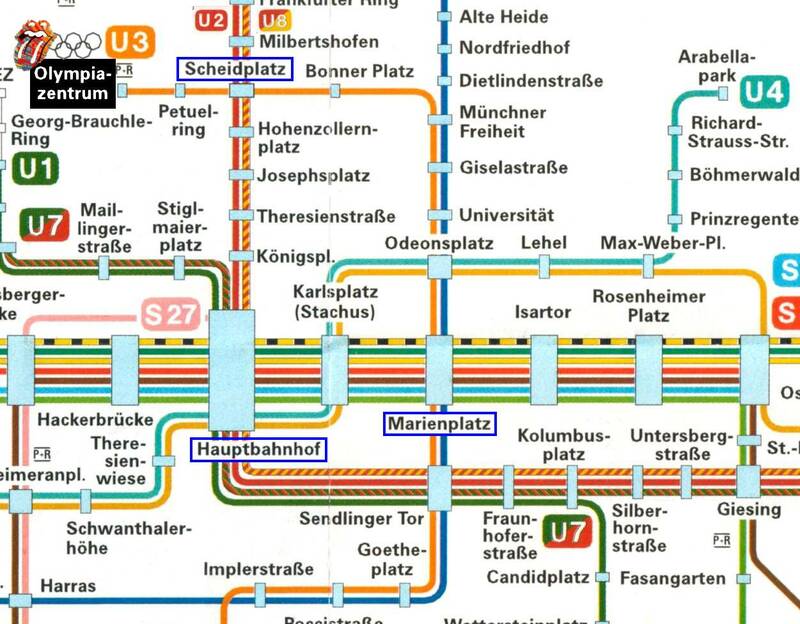 You can find maps of public transport under MVV M�nchen. Directions If you want to find a quick way to a special location by the tube use this link to find the shortest way www.mvv-muenchen.de/fahrplanauskunft. You can type addresses or stations from your starting point and the system search the shortest way. In english mvv-info-service. Go with the tube "U 3" in direction "Olympiazentrum" - follow the signage to "Olympiahalle/Olympiastadion" If you see the television tower in front of you you are on the right way - or the easiest way - follow the people because there is only one way to stadion and hall If you are in the Olympiahalle the arena entrance is not so easy to find - but if you follow the signage "D1-D2" you get in the Arena direct in front of the stage on Keith side.. Easiest way is per "S-Bahn" - station "Hackerbr�cke" - there is only one exit. If you see the central terminal of munich in front of you have to follow the street on the left. Go 300-400 m and you will the circus on the right. Click on this underground city train map to get a bigger map! According to statistics, Munich is one of the safest European cities. Still, as always beware of pickpockets and it might not be the best idea to stroll alone through the English Garden at night, especially if you are a woman. There are dozens of organized sight-seeing tours, most of them leave just opposite of the central station�s main entrance. Munich has some world-renowned museums, including the three Pinakotheken (Old, new and modern), with paintings from different �poques. Another famous one is the Deutsches Museum, featuring all kinds of technological stuff from cars to coal mining. Adjacent to the museum is the amazeum, hosting Munich�s IMAX-theater, where they show Live at the max at the moment ( www.amazeum.de). You can find maps for hall and stadium under www.olympiapark.de. Cirkus Krone is what the name says: a circus building, so it is pretty much a round building with a small standing area in the center and seats around. In this season you should visit the Bavarian "Biergarten". Here you can get local food and drink (beer). F. e. "Augustiener Biergarten" very near to Krone (Arnulfstr.). "L�wenbr�u-Keller und Biergarten" also near to the Krone (Nymphenburgerstr.). But the best are the small "Biergarten" in the villages in sorrounding from Munich. Hard Rock Cafe Everybody knows it: Hard Rock Cafe M�nchen. Orlando Haus - Restaurant, Bistro & Keller. Wednesday June 4 at 2-4 pm (14:00 - 16:00). Address: Platz 4. U-bahn: Marienplatz. Same sqare/place as the Hofbrauhaus. And only two minutes from the Stones hotel. Look for the nice building with the letters "Orlando Haus" on the top part. Outside there are many tables, often free space. And they serve Augustiner beer - one of the best. This is a typical place for beer, food and talking. Anything more important to say? Thanks to Thomas Horvath, Philip Bajo, Arno Kluenter, Stephan Fuchs, Johannes Delmere and Christian Zorn for information!